A boatload of injuries slowed the Dodgers after winning back-to-back N.L. Pennants in the 1979 season. They finished 11 1/2 games off the pace of the Western Division-winning Cincinnati Reds. The Dodgers lost Tommy John through free agency, who had won 20 and 17 games in the two previous pennant-winning seasons. 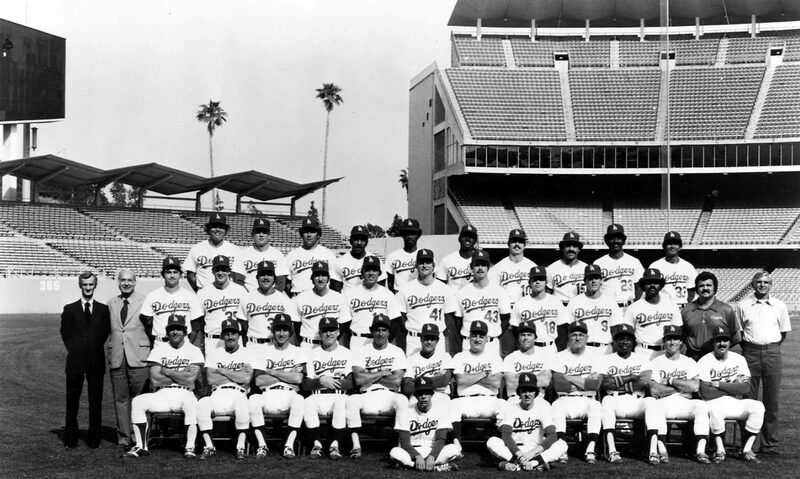 Major restructuring of the bullpen and starting staff brought back Andy Messersmith to the Dodger fold, Jerry Reuss from Pittsburgh for Rick Rhoden and thrust Charlie Hough and Lance Rautzhan into key relief roles. Unfortunately, Messersmith was finished in June with season-ending surgery. Doug Rau, a crafty left-hander, also underwent season-ending shoulder surgery. Outfielder Rick Monday went under the knife for his heel problem and pitcher Terry Forster was also operated on. Right-handed pitcher Rick Sutcliffe had a fine season, going 17-10 with a 3.46 ERA and was named N.L. Rookie of the Year. 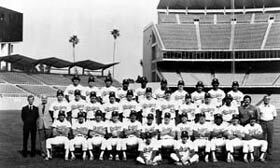 The Dodgers led the league with 183 home runs, as Davey Lopes, Steve Garvey and Ron Cey each had 28. Garvey, a model of consistency, batted .315 with 204 hits and drove in 110 runs while playing in all 162 games for the fourth consecutive season. After dropping 21 games under .500 by the All-Star break, the Dodgers came back to win eight of nine after the layoff to help right the ship. Lopes dropped his role of team captain after a stormy clubhouse meeting to clear the air on July 16. Reggie Smith injured his leg in the second game after the All-Star Game and never started another game. 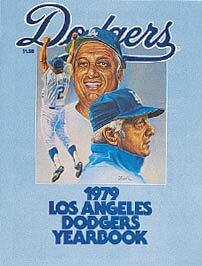 Don Sutton finished with a 12-15 record, while Burt Hooton was 11-10 and had a 2.97 ERA. In a sad turn of events, the First Lady of the Dodgers, Kay Hanson O’Malley, passed away in Los Angeles on July 12. Just 28 days later, Walter Francis O’Malley passed away at the Mayo Clinic in Rochester, MN on August 9. Immediately, tributes and sympathy poured in to the O’Malley family and the Dodgers from all over the world. 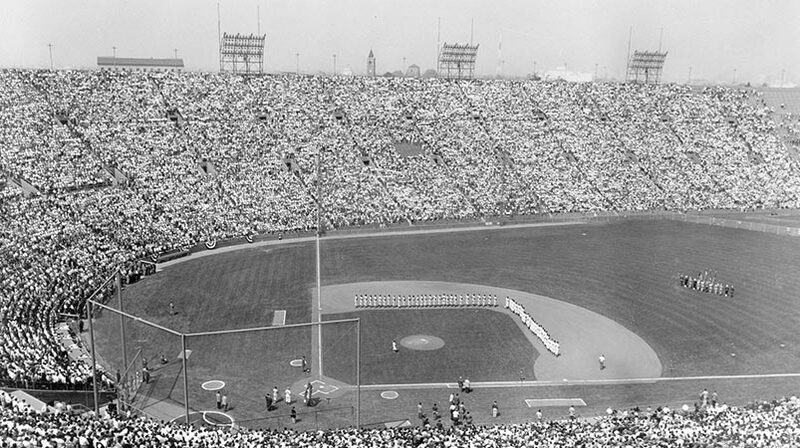 In Tokyo, prior to a game between the Yomiuri Giants and the Taiyo Whales, a moment of silence was held and a stadium prayer for the “repose of Walter O’ Malley’s soul.” At Dodger Stadium, the flags were lowered to half mast and a moment of silence paid homage to his memory and the baseball shrine that he built. On Sept. 2, Manny Mota collected his 145th pinch-hit with a single against Chicago to break Smokey Burgess’ all-time major league record. In January 1979, left-hander Fernando Valenzuela signed a contract with the Dodger organization after his contract was purchased from Puebla of the Mexican League. In the June Free Agent Draft, pitchers Steve Howe (1st round) and Orel Hershiser (17th round) were selected by the Dodgers. 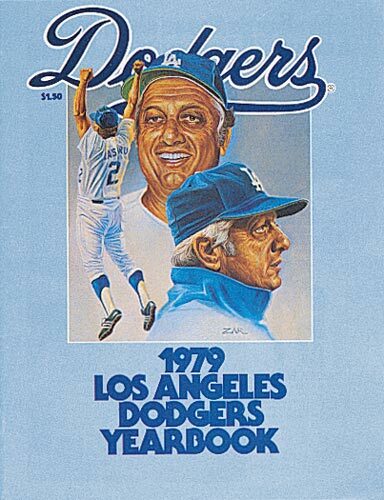 Click image for a larger view1979 Dodger YearbookCopyright © Los Angeles Dodgers, Inc.
Click image for a larger view1979 DodgersCopyright © Los Angeles Dodgers, Inc.